Every summer I make enough low sugar organic Canned Vanilla Bean Peaches to last me all year. 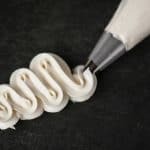 Our family loves them and they make great DIY gifts as well! Have you ever canned anything? If you’re anything like me, you’ve spent years wishing you had the confidence to can things, but never quite made it happen. For me, the whole process just seemed so complicated and I thought for sure that I was going to screw something up or indefinitely give my family botulism. 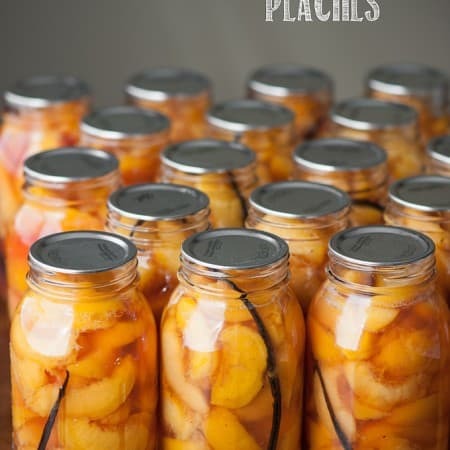 I’m happy to say that I’ve been canning peaches for several years now using the method I explain in this post and have yet to give my family food poisoning caused by a bacterium (botulinum) growing on improperly sterilized preserved foods. Yay for that! 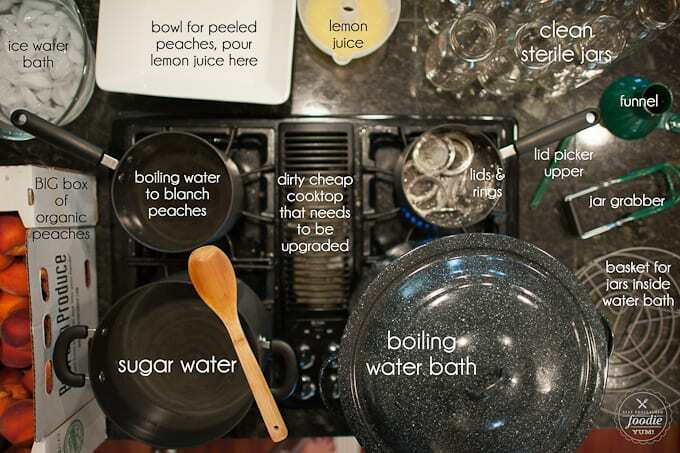 I’ll start with a top view photo of what my kitchen island looks like during my canning process. I’ve made them several times without taking photos because, frankly, when I start canning I go straight into beast mode. Ain’t no one more efficient at canning than me. You can see how I have everything set up and then reference the photos when you read through the procedure in the recipe section down below. I always buy organic peaches. They can be a bit hard to find, even at the farmer’s market, but I have used the same farm for years and their peaches are extraordinary. I would never go to the grocery store to buy peaches to can. Who knows where they came from and how long they’ve been in storage. Plus, when you buy in bulk direct from a farmer, the prices are usually best. This year, I bought my boxes on a Saturday and let them ripen until Tuesday, at which time they were perfect. You want the peaches that you’re going to can to be perfectly ripe – not mushy or hard. Plus, if they’re fragrant than they most likely taste great as well. What you see below are the peaches with their skins removed. Now, the vanilla beans are totally optional but highly recommended. I always have vanilla beans because I also make my own homemade vanilla extract, which is also a great DIY gift that people love to receive. 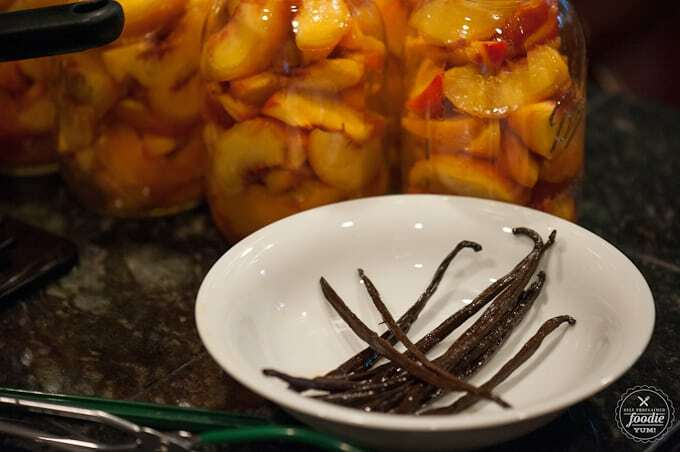 Before you add the peaches, just throw half of a vanilla bean that was split lengthwise in the jar. Try to handle it carefully to keep as many seeds in there as possible instead of on your fingers. Over time, all those wonderful tiny vanilla bean seeds will float out and help give the peaches an unbelievable flavor. You can see below how full my water bath canner gets with 7 quart jars. They displace the water quite a bit, so be prepared to add or remove water as needed to ensure they are fully covered by at least a full inch of water. My very last round of peaches always gets the remaining peach juice and lemon juice mixture from the bottom of the bowl. This not only changes the color but it also changes the flavor. That’s totally optional, but I always do it and wonder why you wouldn’t too? I always store my peaches without the ring. They aren’t necessary and just create a situation where it might stick. They all go in a box and get reused for the next batch. This recipe uses vanilla beans. Did you know you can make your own homemade vanilla extract? It makes the perfect gift too. Watch how in the video below. One large pot containing 2 cups sugar and 20 cups water. Heat on high until sugar dissolves, then turn heat to low to keep warm. One medium pot filled with boiling water to blanch peaches. May need to refill as water level decreases. One small pot full of water kept at a temperature just below boiling. This is where you put the lids and rings until you are ready to seal the jars. Last burner is for your water canner. If you are going to fill canner to the max with 7 quarts, the water level should be about 4-6 inches below the top. Cover with the lid and set heat to high to get water to a rolling boil. 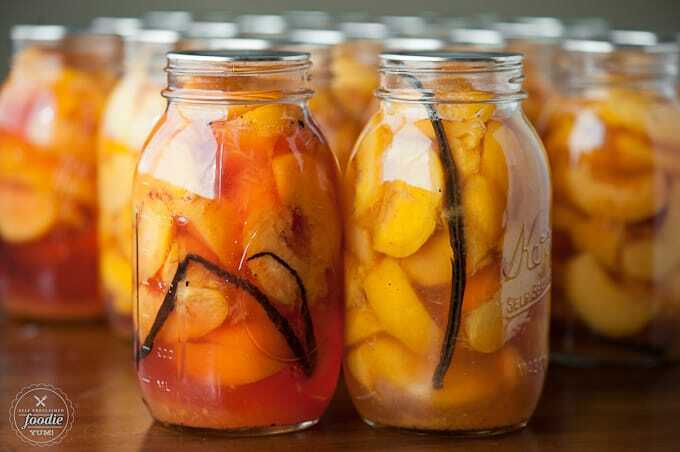 You may need to add/remove water once the jarred peaches are in. Run all of your empty jars through the dishwasher prior to using. Get all four of your pots going as described above. Set out a large bowl of ice water as well as another large bowl to hold your peeled peaches. Juice your lemons and set aside. Four peaches at a time, score the skin on the top and bottom of the peach in the shape of an "x" with a sharp knife and then place in your blanching pot. Allow to sit in the boiling water anywhere from 30 seconds to 3 minutes. Remove them with a slotted spoon when you start to see the skin peeling away. 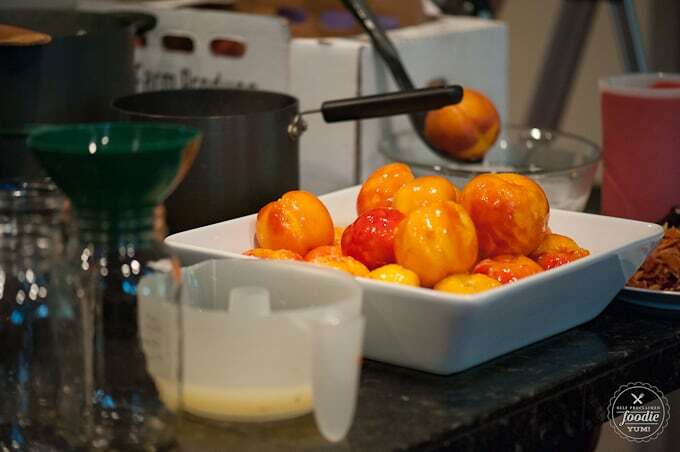 Transfer hot peaches to an ice bath and repeat that process with another four peaches. Remove the skin from the peaches in the ice bath by pulling at the corners and transfer peeled peaches to large clean bowl. Cover with lemon juice. I typically pour all the lemon juice in at the beginning so that the peeled peaches can roll around in it and keep their vibrant color. 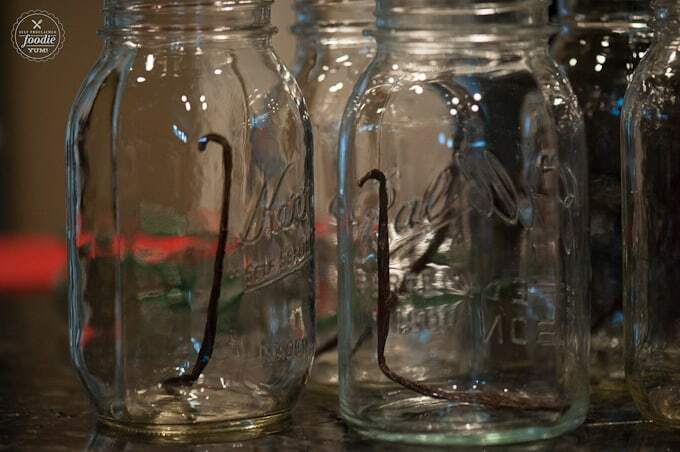 Add half of a vanilla bean to each empty clean jar. When you have enough peeled peaches to fill 7 of your quart jars (for me that's about 4 peaches per jar, a total of 28), start slicing them up. I like to hold the entire peach in my hand over the peach bowl so that extra juices land back into the bowl and use a small paring knife to cut slices all the way around. Then, once the entire peach is sliced, I transfer them to the jar through the funnel by pulling the slices away from the pit. Fill each jar to the bottom of the rim. Using a ladle and the funnel in the jar, fill each jar with sugar water. Be sure to leave a good half inch from the top empty. You will need this space in order to get a proper seal. 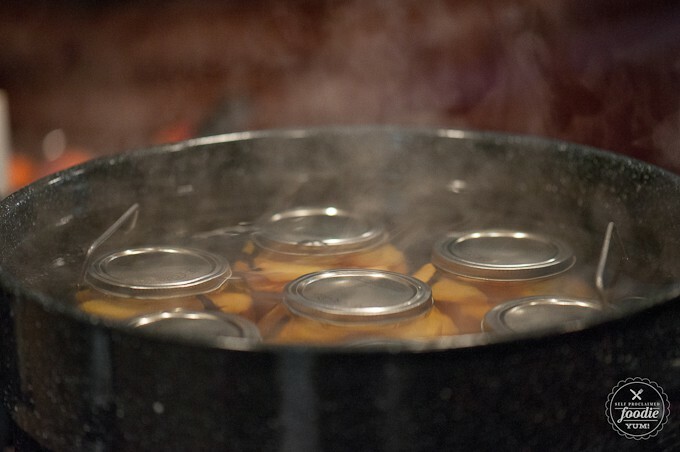 Best practice is to use the plastic air bubble remover wand that came with your canning kit to move the peach slices around to let the air pockets rise to the top. This will let you know if you need to add more liquid. Once all the jars are filled, use the magnetic wand to pull your clean lid out of the hot water and place it on the top of the jar. Pull a ring out of the hot water and secure it to the jar. You want to screw it on securely but not tight. If its too tight, the air bubbles can't escape and you can't get a good seal. If its too loose, you risk your peaches spilling out. Just nice and hand tight. Place the 7 full quarts with lids into the boiling water. Either do this one at a time using the jar holder or place them on the round grate and lift them down into the water all at once. 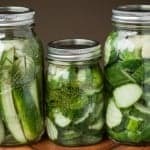 Ensure that the jars are covered by at least 1 inch of water. Keep temperature on high and cover with lid. Allow to process in water bath for 22 minutes (this time may vary by elevation and I'm close to sea level). 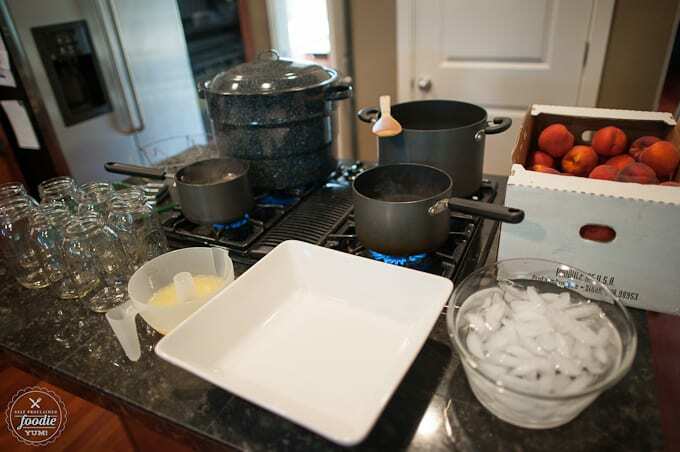 If water starts to boil too rapidly, you may crack lid to allow some steam to escape. Remove jars and place them on a towel on the countertop. Within about 30 minutes you should start to hear the lids pop meaning that they are vacuum sealed. Allow to cool overnight. Repeat until all peaches have been used. You may need to make more sugar water if you run out with the ratio of 1:10 sugar:water. With the last batch, I always transfer the lemon/peach juice to the jars before I add the hot sugar water. This changes the color and the flavor, but I love it. The next day, ensure all of the jars have sealed. You can see the little dip in the lid, otherwise press down and it shouldn't move. If any didn't seal, do not store. Just eat them up. Remove the rings and soak to remove any stickiness. The rings are not necessary for storage; just the sealed lids. Rinse the jars, taking care not to bump the lids to break the seals. I keep mine stored on shelves under my stairs away from light in steady temperature. Not sure of the shelf life but I typically make enough during the summer to last all year until its time to make more! Hi! Trying this recipe out now. Should be good.Note of clarification, I think in process step 4, you mean peeled, uncut peaches, as opposed to unpeeled. Thanks! I tired your recipe, thank for such great notes! My peaches all floated to the top. I have a couple inches of liquid at the bottom. Has this ever happened to you? I like the look of these peaches. But for me and my husband this is to much to start with. Can I cut the recipes in half? You sure can! Get it? CAN? Canning? 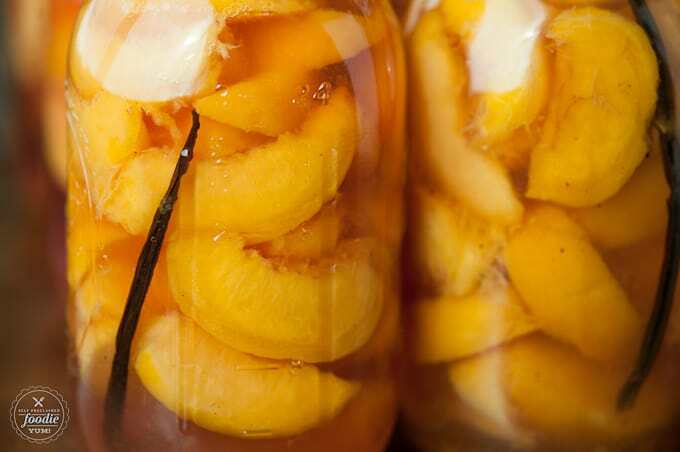 Do your peaches shrink during the canning process? I filled the jars full, and after canning, they were only 50% full. Should I force more peaches in the jar when filling them? The recipe calls for 7 vanilla beans split in half, enough for 14 jars, yet the recipe calls for 21 jars. 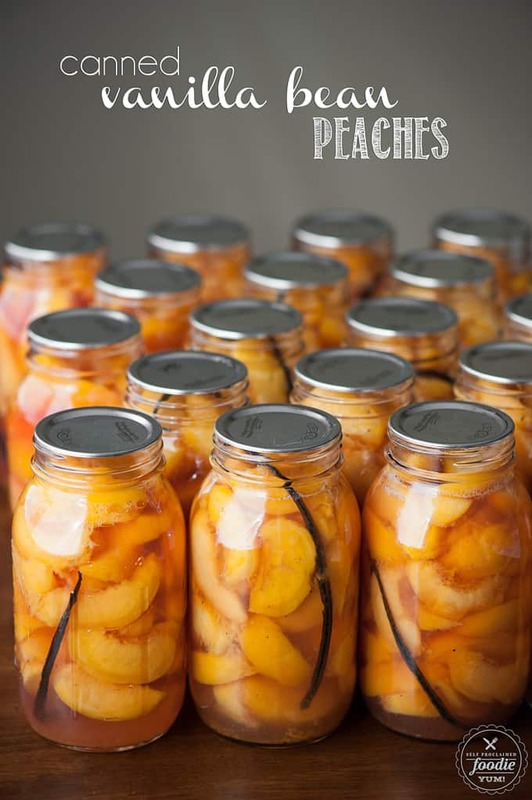 7 jars of just plain canned peaches? So, you use 21 jars and 7 vanilla beans split in half. How do you make the math work? Do you need more beans, or do you cut the bean smaller? When you say, you let them sit a while, do you mean a few days, weeks, months? I just finished some today and can’t wait do dive in, but want those little seeds to do their magic! The longer you wait, the more intense the vanilla flavor. This recipe looks amazing! 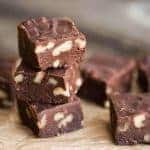 Do you happen to have a smaller batch recipe? 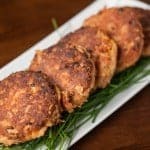 Any chance you could make a DIY video with this recipe? I’m very visual. Well, I canned peaches again this year but didn’t video the process because I simply go into beast mode. Two of us canned for four hours and I didn’t have the stamina to deal with the camera.